Go super cute with a ring bearer short set! This tailored outfit for the youngest male in the wedding party offers several options. It can be styled for a formal wedding tuxedo or a casual beach wedding complete with khaki shorts and a Hawaiian shirt. Just be careful, this short set steals the limelight for most adorable. Traditionally, ring bearers wore Eton jackets and short pants or knickers for weddings. Although times and conventions have changes, there are a variety of reasons for shorts outfits, and many types of these that ring bearers can wear. Shorts are perfect for spring and summer weddings, or even early autumn weddings before the weather turns cool. For brides who reside in warm climates, choosing an outfit with shorts rather than pants for the ring bearer can help make the child much more comfortable. If children will be permitted at the reception, shorts can also be a wise choice to allow the young man to dance or play. The type of ring bearer outfit with shorts a bride chooses will in large part be determined by the formality or time of wedding. For a formal summer wedding, a shorts tuxedo outfit can be the perfect answer. Weddings with a vintage, medieval, or Victorian theme may also choose to have shorts for the ring bearer to reflect the type of dress conventionally worn by ring bearers in these past eras. Formal shorts are often cuffed for boys. For theme weddings, an appropriate theme shorts outfit could also be chosen for the ring bearer. Western weddings, for example, could have the young man dressed in denim shorts and a western shirt with bolo. Depending on the type of shorts outfit you need for the ring bearer, purchasing options may be expansive or fairly narrow. For a casual wedding with a dress shirt and dark or tan shorts, options will include department stores and children's clothing stores. Many tuxedo rental shops also have a selection for boys. For period knickers or shorts ensembles, you may need to find a store or costume shop that carries apparel from the era you're looking to replicate for your wedding. A list of stores that carry short tuxes and other shorts choices for ring bearers follows. Grammies Attic carries vintage and heirloom special occasion wear include boys' short outfits. Dapper Lads includes a sweet selection of whimsical children's wear for boys and girls appropriate for weddings. 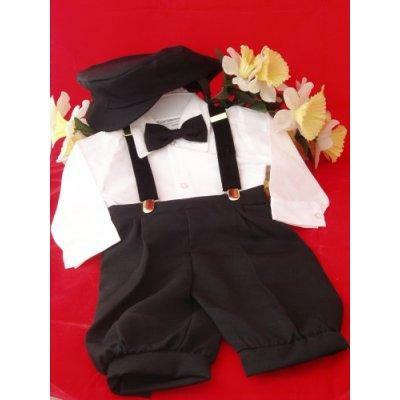 Tiny Tux.com has a wide selection of ring bearer wear, including formal short sets, short tuxes, and colored shorts suits. While the bride typically chooses the style of clothing she would like the ring bearer to wear, primarily to harmonize with the wedding itself and the apparel of the other wedding party members, it should be up to the ring bearer's parents or pay for the suit or short ensemble. If you have something very specific in mind and find what you want, you may want to consider asking the store to reserve the outfit you've chosen. Secondhand stores can be an excellent choice for finding gently used ring bearer shorts ensembles. Be careful when purchasing dark colors, however, to make sure the colors will match or harmonize with the rest of the wedding party. If pieces are vintage or have been washed incorrectly, dark shorts or jackets could be faded in comparison to the apparel of the groomsmen or ushers. A ring bearer short outfit can be a quaint option for this youngest man in the bridal party, and there are many creative choices for this a comfortable and distinctive attire.